Designed by Jim Lusty circa 1930, the model 5394D has all the best aspects of the ´Modernist´ era. 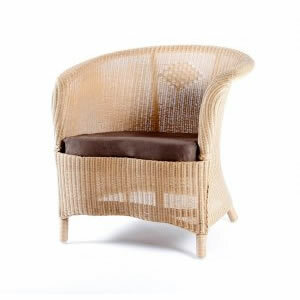 This delightful Lusty Lloyd Loom tub chair with a serpentine rail and skirt has been sold around the World, where it can be seen gracing homes, hotels, Gentlemen´s Clubs and The Officers´ Mess. This comfortable and practical lounge chair has a feel for the period, yet is quite at home in either traditional or contemporary surroundings.